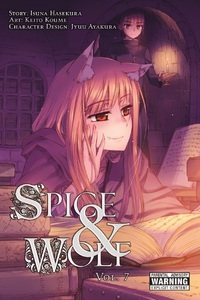 A new chapter unfolds in the travels of Lawrence and Holo! The pair arrives at the church in the village of Tereo to glean information about Holo's homeland of Yoitsu. But Elsa, the deaconess, turns them away flat! What has happened to make her so suspicious? Could it have something to do with the neighboring town of Enberch?